In July of 2017, a game studio called Akinaba took to Kickstarter to fund their new game called Design Hero. Now, a little over a year later, the game is finally being rolled out. The game got backed by almost 200 people who pledged quite a lot more than the original goal. 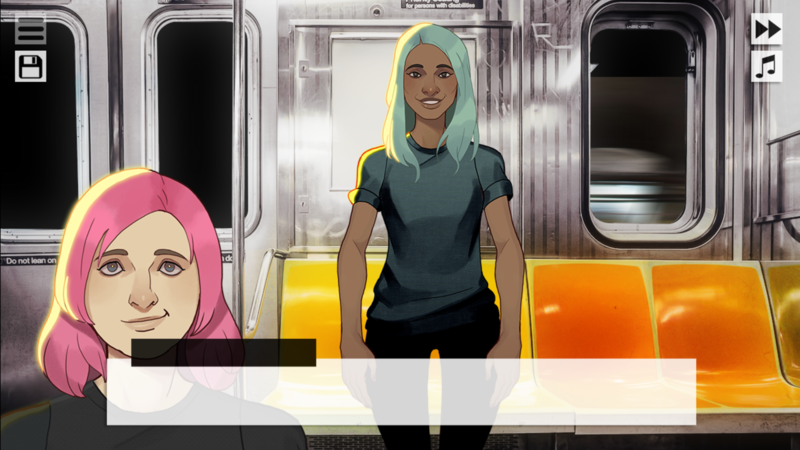 Akinaba doesn’t keep its influences a secret either; they mention games like Phoenix Wright, Hatoful Boyfriend and Dream Daddy as well as the art style of Tetsuya Nomura (Square Enix) as their biggest inspirations on their Kickstarter campaign. With these giants as their examples, Akinaba sets the expectations for their game quite high. But the question is: can they live up to these expectations? Design Hero follows the story of a young graphic designer struggling to make it in the world of graphic design. Most of this backstory is derived from the real world issues most graphic designers face nowadays: getting offered exposure instead of getting paid, clients who ask for free work, having clients steal their work, etcetera. 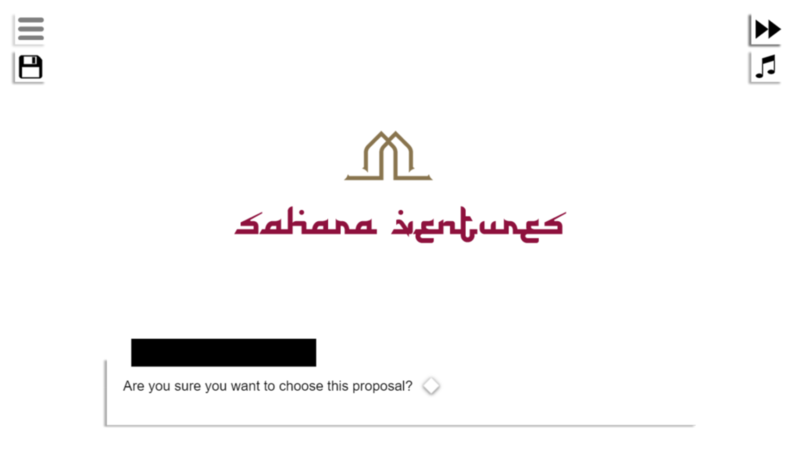 The character, whom you get to create and name yourself, then gets an email from a huge graphic design company called Jagger & Jones, regarding an offer for becoming an intern at their office in New York City. Your character idolizes Trevor Jagger, the CEO of this company, so getting this job offer is a huge deal. The main way the story is told is by dialogue. Every character you meet has their own personality. Your coworkers teach you how to be a graphic designer, and then you get to help them create and work on assignments given to you by clients. The flow of this is rather slow, as the game takes longer than necessary to go from one line of dialogue to the next. And since there is no voice acting in this game, you are left having to read everything. 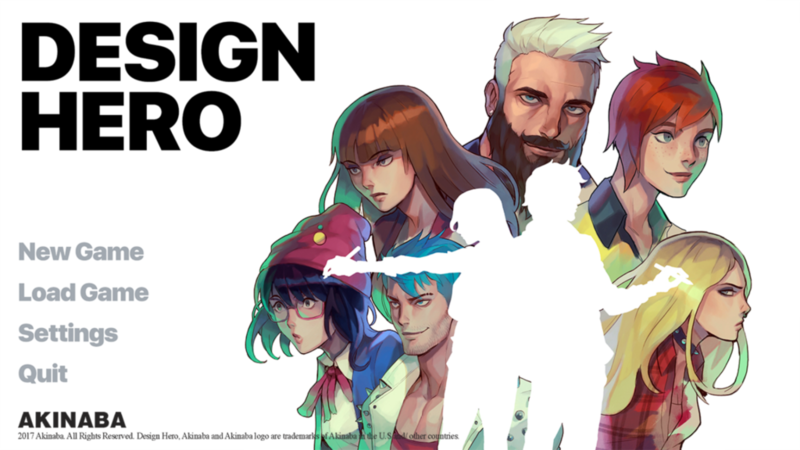 The graphics of Design Hero are clearly very heavily influenced by games like the Phoenix Wright-franchise. The art style is really nice and the characters look varied and good. They even have various facial expressions. However, all characters are seen from the front, even filler characters. This makes for a few awkward moments. The game itself has an anime feel to it. You spend most of the game in an office space, so you won’t get a lot of variation in environments. When you hang out with your colleagues, they all take you to a different location, but each character will only take you to one place. The music you hear while playing this game is really repetitive. You can easily hum along to every track after listening to it for about a minute or two. Fortunately, you have an option to turn off the game music. However, there is barely any to no voice acting in this game. One of the only times you will actually hear a voice while playing this game is someone saying “Rockstar” after you finish creating your character or when you finish an assignment. Besides that characters will frequently just make awkward noises, and there seems to be only one or two voices for every gender. There are sound effects that emphasize certain things that happen, but you hear them so frequently that they quickly lose their meaning. 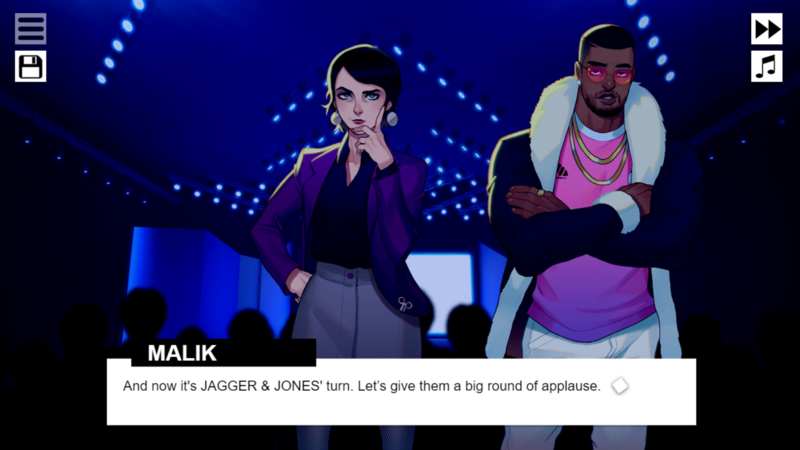 Design Hero is a visual novel. The games works with a five-chapter system. The game starts with some sort of big presentation. A whole bunch of characters are shown, which is a little bit confusing. Some characters don’t get introduced, others are named but not shown. You then go a few months back in time, to where you are just an independent and struggling graphic designer. Your character is texting with an unnamed character. The conversation that follows is very confusing and only seems to set up the fact that being an independent creator is tough, and money is scarce. The main way to traverse this game is by using your mouse. You get two or three choices when talking to people and when you’re designing brands for clients. Sounds simple enough, right? Sadly though, the game doesn’t seem to respond to about half of your mouse clicks. Sometimes you have to really slam your mouse in order to have the game respond. This can get really annoying really quickly. The game doesn’t seem to be giving you any make or break decisions. Every time you work on a certain part of a design, you get graded with either a C, B or A, depending on how well you did. This only affects how much you get paid, but making much or little money doesn’t affect your gameplay in any way, as the only way to use the money you make is by buying useless items. Most of these items are also obtainable for free by hanging out with your coworkers. When you fire up the game, it has you pick a language from three options: English, Spanish and Portuguese. However, the English used in this game leaves much room for improvement. A lot of the dialogue in the game is laughable. For example, at a certain point in the game your character will say the phrase “I fed up with this world”. The quality of use of the English language doesn’t make the game unplayable, but it will pull you out of the experience and make the game less fun to play. You get to create your own character. One cool thing is that you get to pick between a male, female or genderless character. However, the avatar used for the genderless option is exactly the same model as the female character, as well as the clothing and hairstyle options you’ll get later on. These options are limited to nine for each category, and they all seem very basic. Every character’s name (excluding you own) is a reference to either a song by or a member of the Rolling Stones. 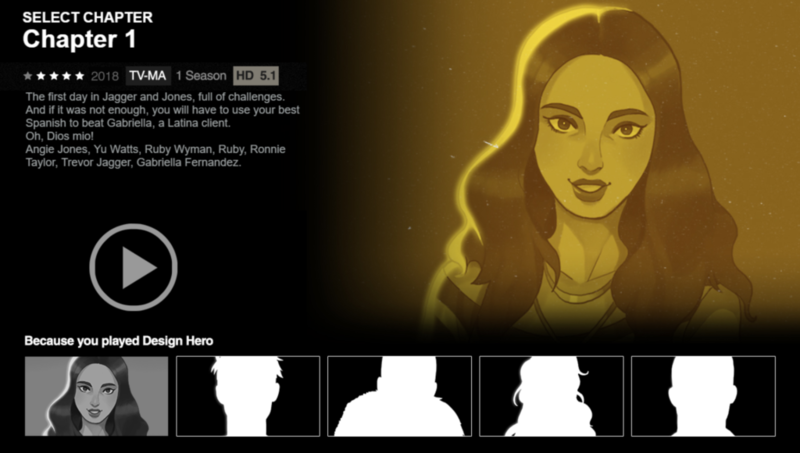 The chapter selection screen is an exact copy of a certain movie streaming service. 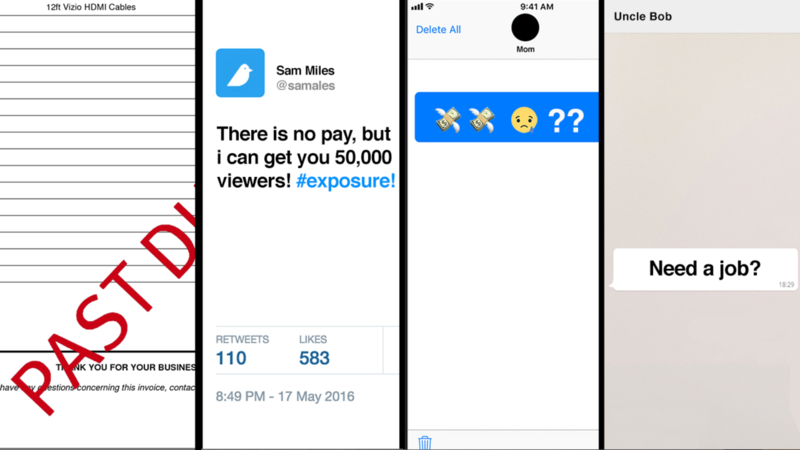 While these might be cool and recognizable features, it can also come across as a lack of originality. Design Hero has a really nice and relatable foundation and backstory. Your character is a struggling graphic designer dealing with selfish clients, which is exactly how things have been going in the real world for the past years. The game has a really cool art style that was heavily inspired by some of the greats. However, when it comes to actual gameplay and gaming experience, the game is lacking to say the least. From repetitive music to a game that is rather annoying to move through, it is quite clear that this game needs a lot more committed work in order for it to stand out.